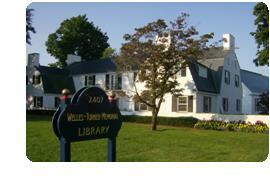 What do I need to do to get a Welles-Turner Memorial Library card? You need to go to the Lending Desk and show proof of residency, such as a driver's license with your Glastonbury address or a recently cancelled piece of first-class mail. Your name and address must appear on your proof of residency. Children ages 17 and under must have a parent with them in order to get a library card. May I borrow materials when I apply for my library card? Yes, your card is issued immediately. For your protection, do not loan your card to anyone else, as you are responsible for any materials charged to your card. Select Login, enter your last name and library card (barcode) number, and Submit Query. Your full name should appear at the top of the screen as well as under Search Tools. Click on your name to view your account information, renew your current checkouts, and more. For assistance, please call Reference at 860-652-7720. How do I renew my current checkouts? • In person: Use your library card, or bring in the library materials you wish to renew. • By phone: Call 860-652-7719, and have your library card (barcode number) handy. • Online: Click here to log into your library account. Most materials can be renewed once, as long as no one else is waiting (Rapid Reader books and museum passes are not renewable). How will I know when a book I'm waiting for is available? You will be notified about available holds by email. (You can provide us with your email address when you visit the library, or you can edit your library account information online.) If you have a spam blocker on your email account, please set it to accept mail from wtmlnotices@libraryconnection.info. Mail will arrive with the subject heading "Hold Available for Pickup." If you do not use email, you can check the status of your holds online 24/7, or you can call Lending Services at 860-652-7719. May I return materials at any other library? Yes, except for museum passes, Rapid Reader books, Kill-a-Watts, eReaders and MP3 players, materials may be returned at other libraries. Please be aware that items returned to libraries outside our consortium (including the South Glastonbury and East Glastonbury private libraries) will remain on your account until they arrive back at Welles-Turner Library. Therefore it is highly recommended that you do not return videos or DVDs to libraries outside our consortium. What are Rapid Reader books? Rapid Reader books are fiction or non-fiction best-sellers that generally have a long waiting list. Because these books are in such demand, we purchase several copies and designate one a "Rapid Reader." You may borrow one Rapid Reader book at a time for seven days (no renewals). Fines for overdue Rapid Reader books are $2.00 a day. How can I access the book drop? The 24-hour book drop is built into the north outside wall of the library, accessible from the driveway that leads from Main Street to the rear parking lot. Put DVDs, CDs and other media in the separate “Video” return. Make sure all materials are fully inserted into the drop so they are not vulnerable to weather conditions; do not leave materials outside of the book drop. Do not include fine money in materials, as it can become separated from your return. Museum passes and eReader devices are to be returned in person at the lending desk instead of in the book drop. Materials returned in the Welles-Turner book drop when the library is closed will be logged in as of the previous open business day. May I borrow materials without my card? Yes. You may use a valid (not expired, address matches your library card record) CT driver's license if you do not have your card with you. However, we encourage you to bring your card with you. Notify the library as soon as possible. To retain your borrowing privileges, you will need to pay for the replacement of each item. There are no refunds for lost items that are returned after payment. Notify the library immediately. You are responsible for all materials borrowed on your card. Replacement cards cost $2.00. Do senior citizens have to pay overdue fines? If you are a Glastonbury resident and 65 years or older, you will not pay overdue fines on most Glastonbury items. Seniors still pay fines for Rapid Readers, museum passes, eReaders and MP3 players. If an item is long overdue and a bill is sent out to the patron, upon return of the item, the senior will be charged the maximum overdue fine for that item. Seniors who check out materials from other Connecticut libraries will pay those libraries' fines for overdue materials. What if the materials I want aren't in the library when I visit? You may reserve materials unavailable at the time of your visit, online or with the assistance of a Reference or Children's librarian. You will be notified by email when the item is available. What if the item I want is at another library? Interlibrary loans are available within our consortium of approximately 30 libraries. Ask a librarian at the Reference desk (second floor) or in the Children's Department for assistance. If you are moving within town, please let us know your new address as soon as possible. If you are moving within Connecticut, you need to get a library card from the library in the town in which you reside. You are then welcome to use that card here. If you are moving out of state, please turn your library card in before you leave.